Day 7 – Oct 31 - Wed – We had our farewell breakfast cooked by another of Ketut’s brothers as Wayan had to go to hospital for an operation. We all had the banana pancake which were delicious but we missed our Breakfast Parade. 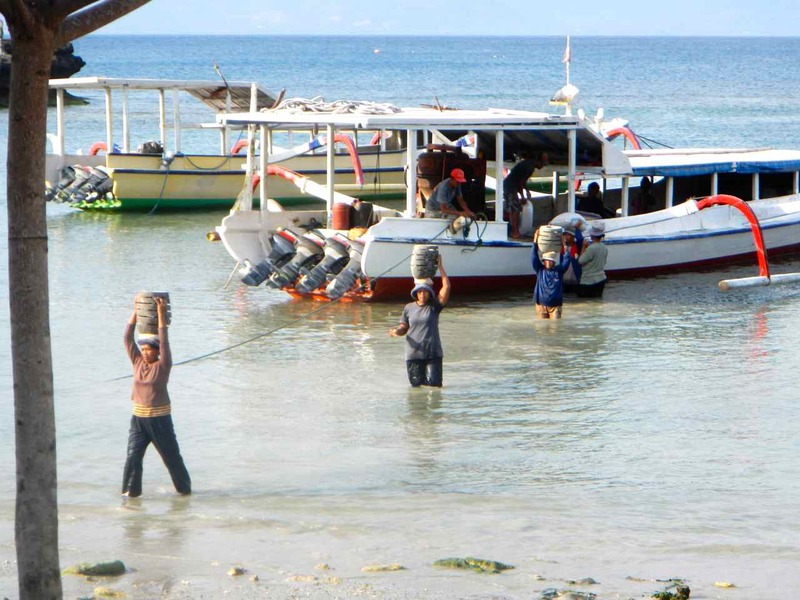 We were delighted to hear our stone carver Wayan would be our driver to the boat to Nusa Lembongan, so we left our little paradise ready for our next adventure, with only one stop along the way at a market to stock up on liquor and nibble supplies. Wayan dropped us at the Rocky Fast Cruises office. We asked to leave early as we weren't taking any chances on the traffic. 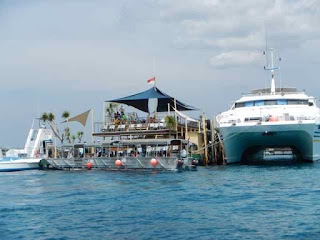 Our reservation was for the 12:00 boat. 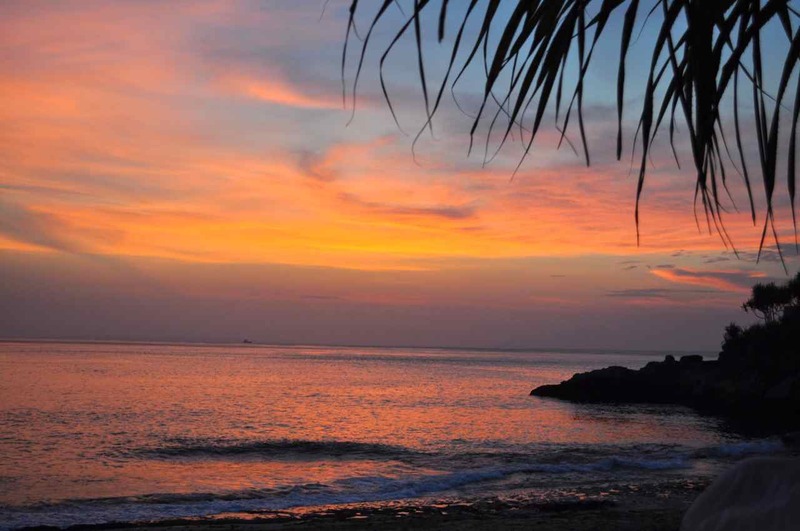 ($50 return trip including return transfer to your island accommodation and again to your next hotel or airport on the mainland, which we think was a good value.) They shuffled us to the beach where Gretch and I did a little wander down the path/shopping to while away the hour wait we had, while the boys monitored the luggage. 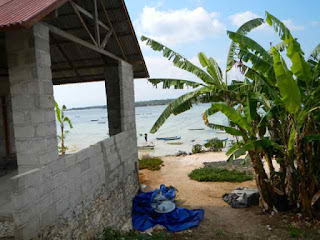 Our ride across took 30 minutes – I especially loved the sandals box on the beach, as you had to wade through the ocean surf to get to the boat. This box was dumped onto the sand on the other side for shoe recovery. 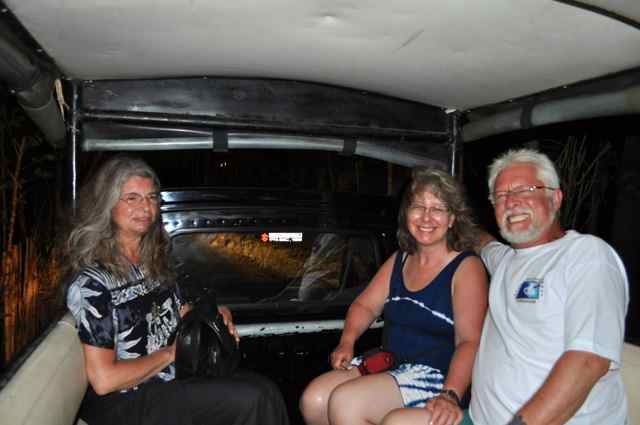 Our ride to Bayshore Huts was in a little safari style open taxi with seats in the back. The huts each had a little veranda, a lovely large bed draped with mosquito netting, a cupboard against one wall, a small vanity and an outdoor bathroom. (Check the Bayshore Huts link for photos of the huts) This would have been a little more appealing if the power had been a little more stable as the poor little air conditioner in both our huts struggled. Graham mentioned it would have been more tollerable if only we had a ceiling fan. Tim said they had one, so we all raced over to our room to check to see if we'd missed it by chance. Nope there was the rheostat and the wiring but no fan. Doh! Sadly the pool was small and was warm so it offered no relief. However the staff was lovely and friendly and couldn't do enough for you. 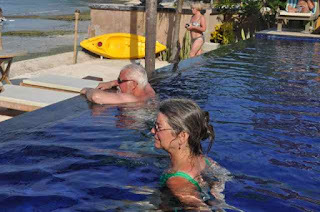 There was always something to watch sitting in the pool or at the restauant as they unloaded boat after boat of goods, from bags of cement to trees. The 'crew' would arrive with rags to put on their head for balance, mostly women and they would start the slow graceful parade of off loading the goods. 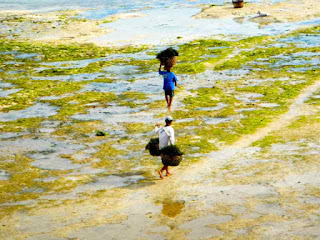 I also liked the early hours of the morning - around 5:30 am - the locals would scavange seaweed on the beaches and the bay awoke. A nice time of day. We had lunch at our hotel, basic food but it was OK, then went for a walk to Mushroom bay stopping for a drink and to watch the sunset. We stayed at our hotel for dinner, nice ambiance with the tiki torches, and being right on the water but the food was not great. Nov 1 – I woke up with a giant red and swollen right eye. Who knows what had a nibble of me during the night. 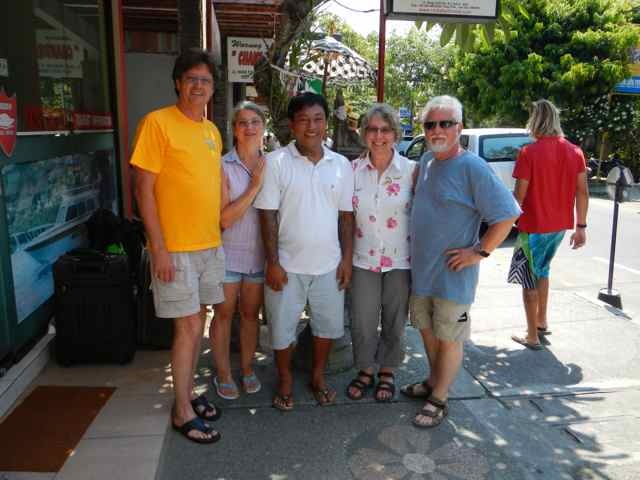 We had coffee and continental breaky at our resort, sent off our laundry and rented scooters ($7. each) and went off adventuring. 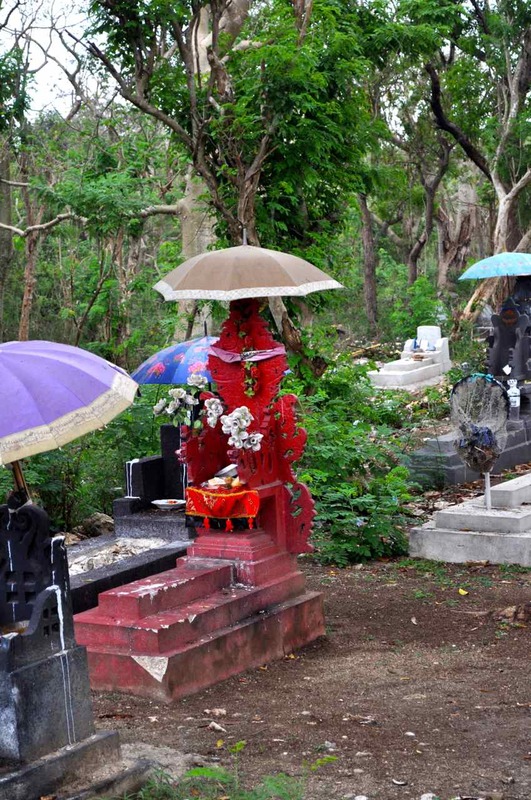 We went out to Devils Tear, which was beautiful, and stopped at the cemetery where we noticed there were umbrellas over the graves. By the time we got to the village we had landed at, we realised we had a flat tire. Graham and Tim left Gretchen and I at a dive shop on the water while they went to get it fixed. We enjoyed a little surf walking until the boys came back with the tire topped up the air, but only made it a block or two before it went flat again. New strategy - Graham and Tim rode back to the villa (we stayed with the flat tire scooter). Next thing we know, our host Nick arrived, jumped on our scooter and said he was going to get it fixed. Gretchen and I looked at each other, not sure what this meant to us, just as Tim arrived and we decided he’d take Gretchen back, then return to get me as who knew how long this would take. Luckily one of those little open transport units stopped beside me as the drive answered his phone. 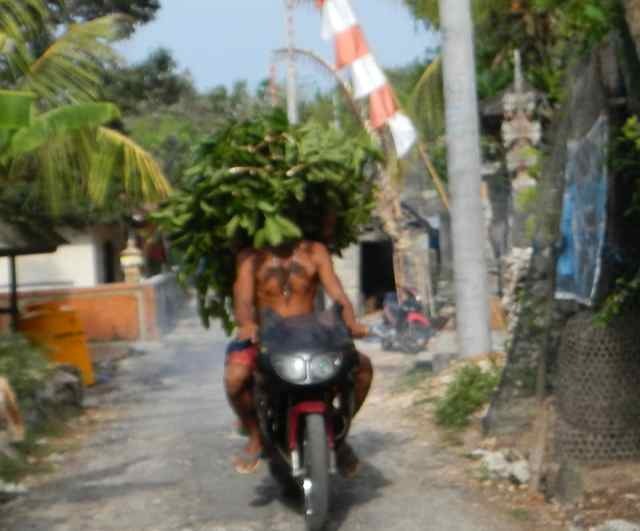 He asked me where I was going so I jumped in and negotiated a ride back for 20,000 rupiah. Along the way it absolutely BUCKETED with rain at which point my driver tried to tell me I should pay another 10,000 rupiah. However I laughingly chastised him wagging my finger "a deal was a deal" and with a cheeky grin, he shrugged and nodded. Whew. Back at the huts, we had a drink on the deck when Nick came back saying he had brought the fixed bike back to where he’d left us but couldn't find us anywhere. He told us he had looked everywhere for us. His comical rendition of ‘Where are my guests? ?’ had us all chuckling. Refreshed and more confident in our scooter we set out again. 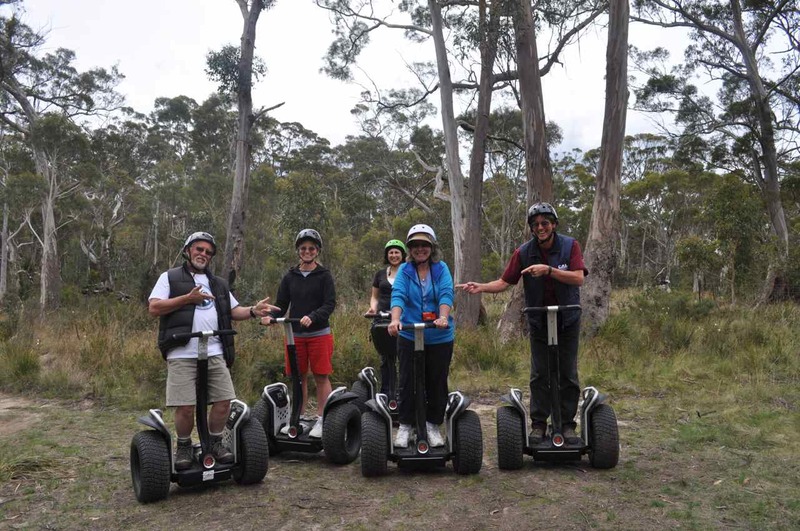 Clearly there were no shocks on these devices, as all of us were groaning at the back rattling ride. We went to the other end of the island crossed the suspension bridge to the second island Nusa Ceningan which we really enjoyed. 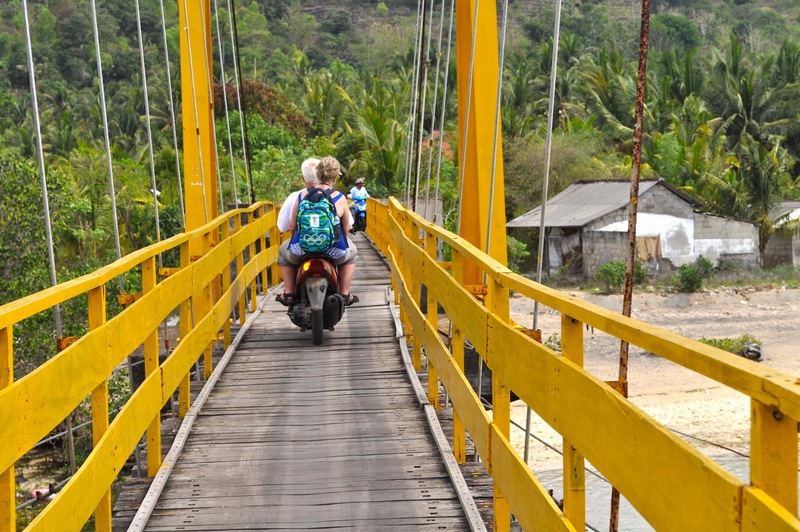 Ah, the yellow bridge. It was very narrow, but looked well built. When I’d read about it, I thought it had said you could walk across it at low tide, so I was a little nervous when we set off. 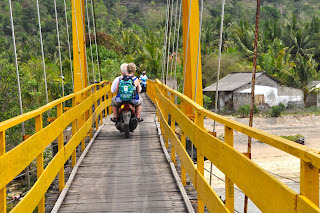 The crossing of the suspension bridge was interesting with the clatter of the planks alarming until I saw a scooter with a local on it, waiting to come the other way. How can he possibly see us? 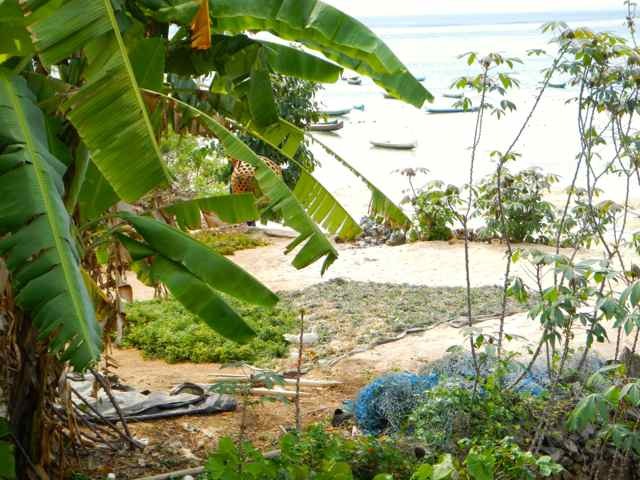 This island seemed less focused on tourism and more focus on seaweed harvesting. 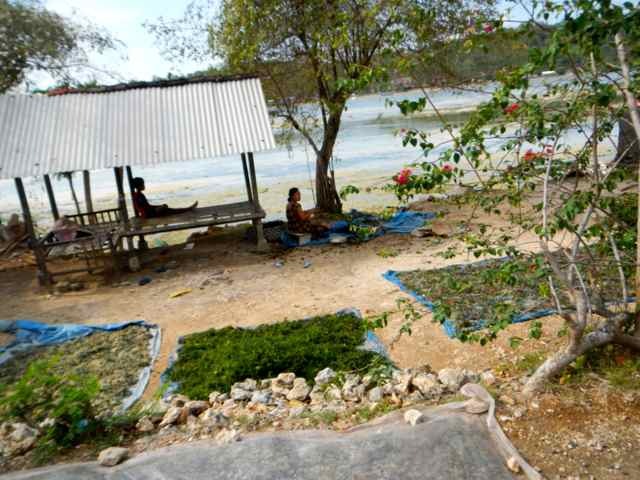 We passed many homes with different sorts of seaweed laid out to dry. 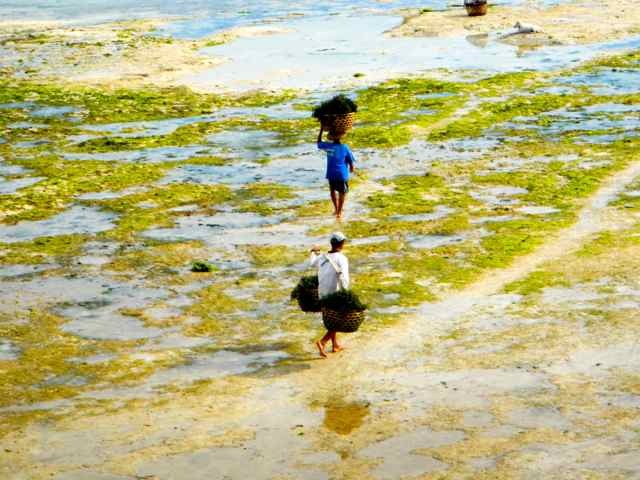 The view of the seaweed farms in the bay reminded me of fields of different crops viewed from a hilltop. 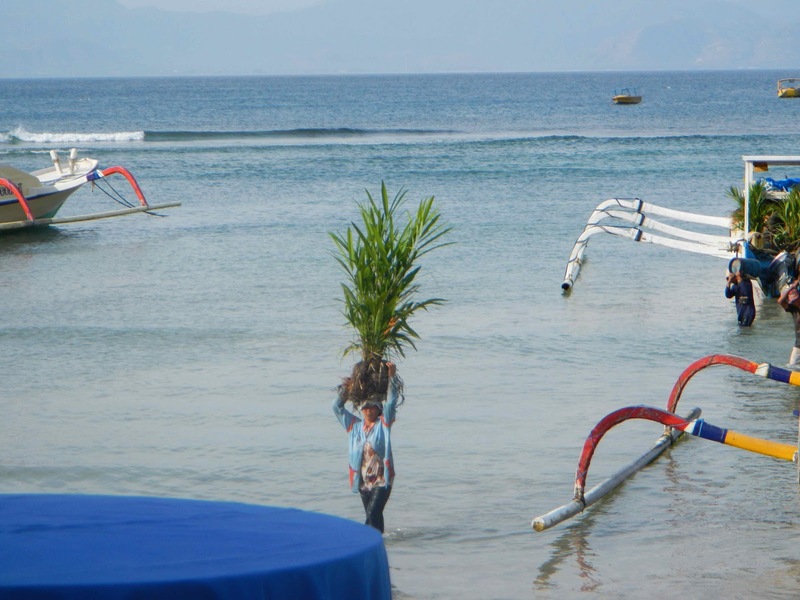 I also liked watching the men and women as they made their way through the water with a slow regular pace, baskets full and either on their head or hanging from a pole over their shoulders. Walking to work has a whole different meaning here. We drove through village areas clearly not tourist focused, passing people relaxing with children trying to keep cool in and around their huts. 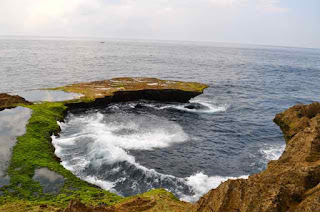 Our trail ended at Secret Beach jumping cliffs where for 5,000 rupiah you can jump off a 25-meter limestone cliff into beautiful blue waters, returning via a climb up a bamboo ladder. No thank you, and we didn’t see any other takers. The water and shore was beautiful, complete with a pod of Dolphins frolicking when we arrived. 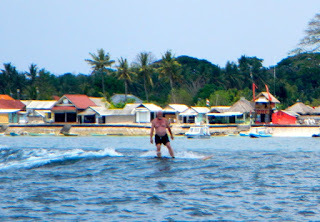 There were also some folks surfing in the little bay. I noticed a lot of French people visiting these islands. As we drove into the jumping point area three little tykes stopped us, asked us what nationality we were and sang us a song, which was lovely. Then asked for money, not so lovely. Heavy sigh. I loved the smell of the seaweed drying as we scooted along and the way the locals would break into a big smile at our cheery shout of hello. “We ran out of gas,” They shouted. Half way up the hill they’d run out of gas. Now we know why they have so many little places selling little 1 or 2 liter bottles of fuel everywhere. We finally made it to the Sandy Bay Beach Hut, checked the menu, had a drink and organized them to pick us up and bring us back for a sunset supper. We had just enough time for a quick shower before they came to pick us up. It was a perfect ending to an enjoyable day. The dinner was great, Lobster (painted cray as they call them in Australia) for Gretch, Graham and I, and a Steak Sandwich for Tim, starting with several Singapore slings, and wine with dinner. The sunset didn’t disappoint us with vibrant colours painted across the sky. Another terrific day. Nov 2. We slept in until around 8, met at the restaurant and made our plans over our continental breakfast. 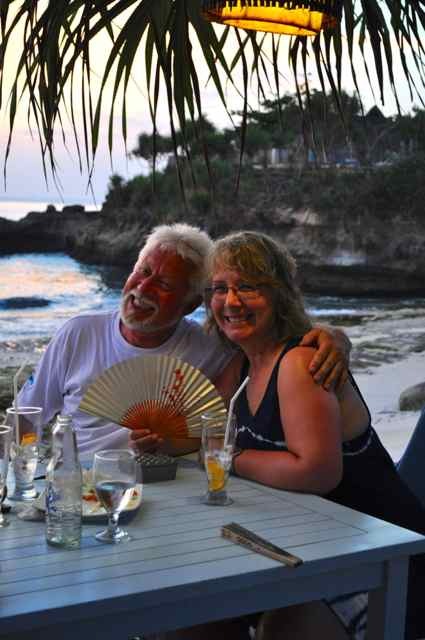 We had eavesdropped on an American couple discussing their snorkeling day… OK I did, so we spoke to them about the best places to go. She was great, telling us where she’d felt uncomfortable about the depth, where they felt wasn’t much to see, where there were lots of fish, and where sea lice had bitten her. All good info. We spoke to Nick and he arranged for a boat to take us to pick up a couple of surf boards, spend a little while at the break called “Playground” then take us to the Mangroves to snorkel. I was really surprised there were multiple surf breaks within the one big bay. Also within the bay are roped off snorkeling areas with platforms, and the really big operations have HUGE catamarans bringing swarms of tourists to their massive multi level platforms, complete with palm trees where they can enjoy a water slide into the ocean, banana boat rides, ferry trips to the beach, and other activities, then back for lunch before they sail away at sunset. All very contained and organised. This is rediculous…. Palm trees? 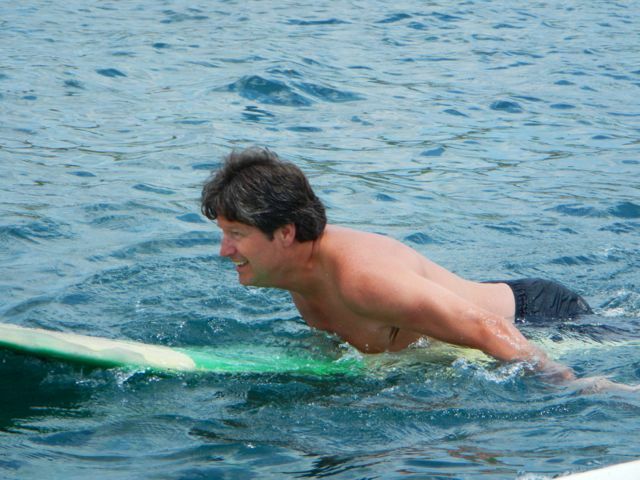 Tim had a bit of trouble staying on the surfboard, something slippery about that fellow, (ba doom doomp). 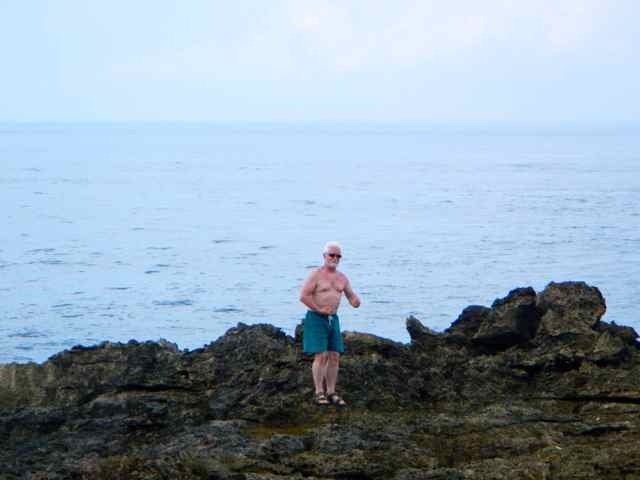 However, we all watched as Graham joined the surfers bobbing in the water. He said as he paddled up, he thought he saw a couple of the big guns smirk. He paddled right into the middle of the big dogs, sat on his board, watched the locals take a couple of waves, then moved into the zone and stood his ground. He picked up his wave, stood up and soared on the top looking like a pro. It was a great long ride and he stood there as the wave ended and he sank gracefully back into the Ocean. 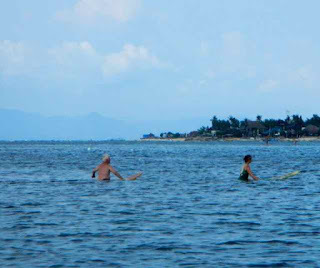 Then he paddled back to the boat and said – OK let’s go and off we went snorkelling. 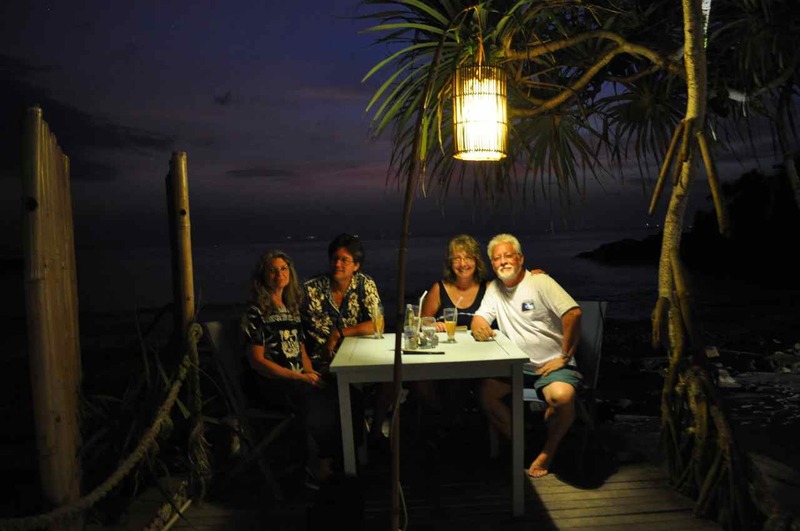 We decided we’d come back after snorkelling and Gretch would give it a try. We went to the Mangroves to snorkel. 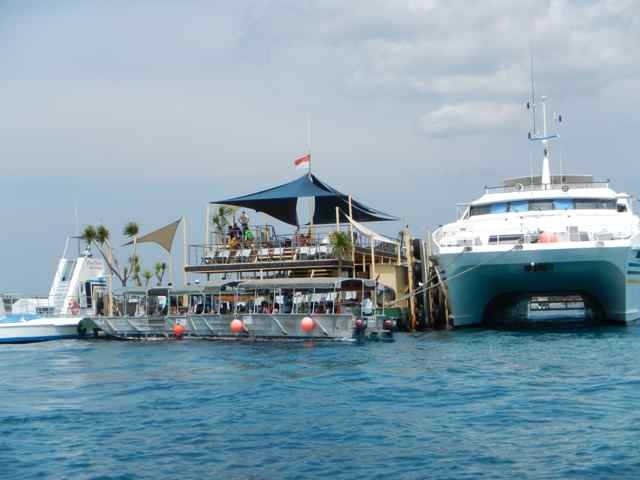 They had many floats, which the boats hooked onto while their guests snorkelled or dove. 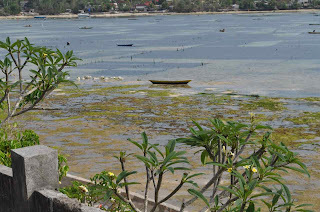 As we were getting ready, our boatman threw a bit of bread into the water and we watched as the water seemed to boil with little tropical fish. I was beside myself to get in worried the fish would get full and we wouldn’t see them again. Nothing to worry about here, as there was a million of them. 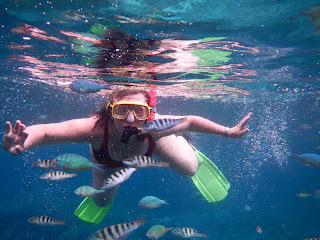 It was like swimming in a tropical fish tank. It had been so long since I’d snorkelled I kept fogging up, forgetting to keep all my hair out of my mask. However in spite of myself, I enjoyed the wonderful colours of coral, the Nudibranchs swaying to the rhythm of the ocean and all the beautiful fish. Some of my old favourites were there – Parrotfish, Angels and lots of new varieties. 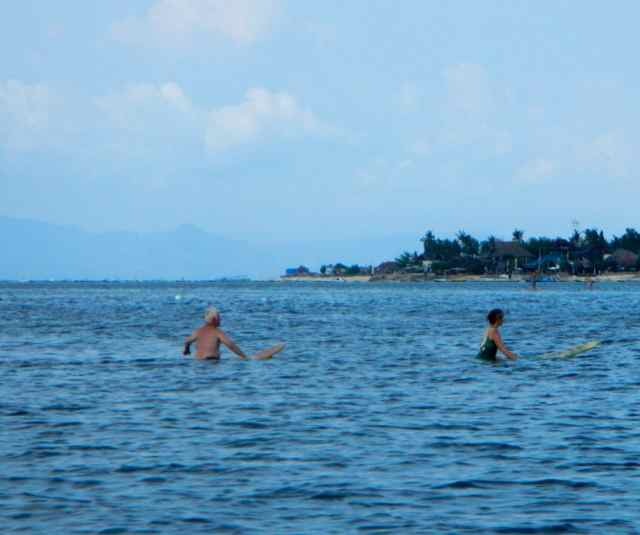 I fought my nervousness and paddled to the deeper blue waters, enjoying the coolness of the deeper water. 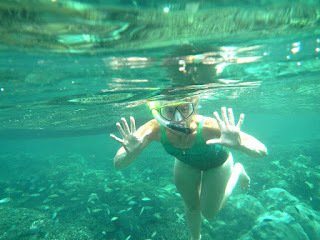 However as I’m not a deep diver I couldn’t see too much so I raced back to the safety of the shallow waters. Tim, Graham and Gretchen were more adventurous and paddled gleefully around like kids exploring much farther afield than I. We headed back to the surfing area which Graham and Gretchen now had to themselves. Sadly this was because the waves weren’t holding but Gretchy gave it a go and is keen to try again. She was pooped and pleased with her efforts when she made it back to the boat. Our own Gidget! Tim and I did a little local snorkelling while they were wave riding, after photos of course. 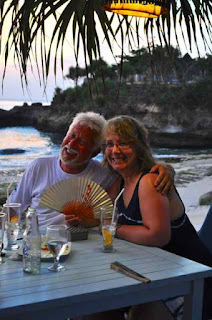 Graham and Gretchy aka "Gidgit"
Back at our huts for a couple of drinks, (and some "after sun cream" – just call me lobster girl) then we walked over to Mushroom bay to the Bali Beach Hotel. Gretch and Tim had the Mie Goring and Graham and I had spring rolls, then a steak. In my opinion - don't order beef steak in Indonesia, they do so many other dishes extremely well. We walked back in the dark, (me with my trusty mini torch) all of us pooped from a day of sun and fun. Nov 3 – Our last day on the island (as Jetstar had changed our flight - but I’m not bitter). We had a lazy morning packing up and settling our bill. 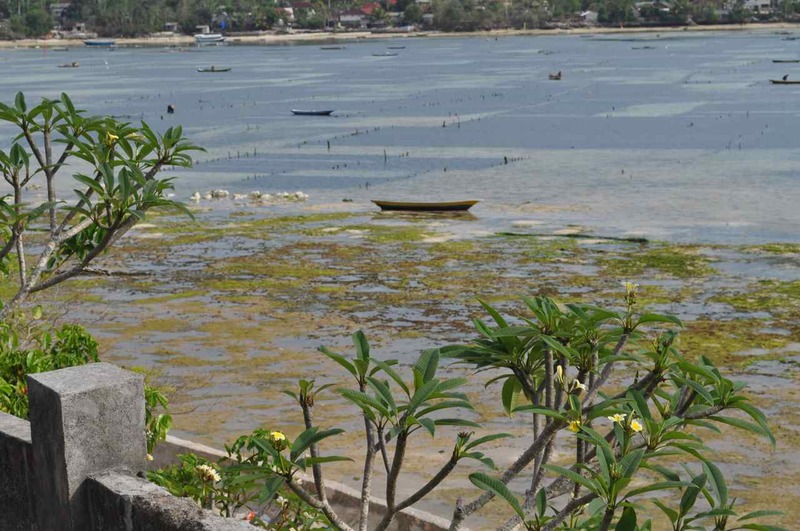 The trip back to the mainland was uneventful, as was the trip to our next Hotel, the Holiday Inn Resort Baruna. The Resort was lovely (check in time was 3:00 pm), but our room as tired, smelled musty and the air conditioner struggled not in cooling the room so much, but the room became humid off and on. We wandered around the pool, had lunch then settled in for a rest, before a dinner on the beach under tiki lights. 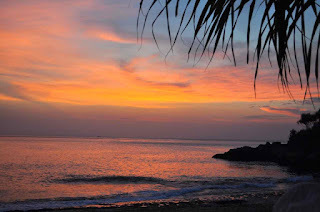 Lovely ambiance…. Having said that, we really didn't like the noise, heat and bustle of the big cities. The hotel does a great thing though - for 25,000 or $25 US you can check your luggage with them, and use the Resort facilities to while away those hours before a late night flight without having to take a room. Tim and Gretch thoroughly enjoyed this. You just have to eat/drink up to your 25,000 value (and pay any extra above) which is no chore with a swim up bar and restaurants. Sadly, during the night I was sick to the point I was afraid I was going to die. I was hugely relieved when Graham woke up and asked if I was OK as I stumbled back into bed the second time, however I wasn’t finished yet. The next morning we weren’t sure if I was going to be able to fly or not, but sipping my trusty Hydrolite and after a nibble of fruit staying down I figured I could do it. 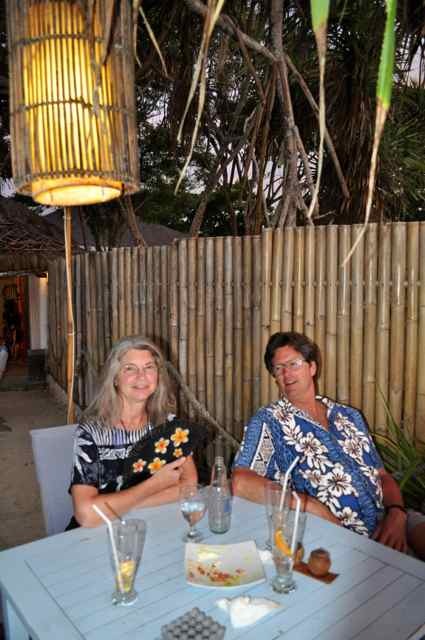 I slept at the duty free in Denpasar while Graham shopped, I slept on the plane to Singapore. I would have slept at the Singapore airport for our entire lay over if Graham hadn't said to me “Don’t you go Invalid on me now.” So I dutifully gathered my energy and we jumped on a train into town. I must say Singapore was clean, the transit system efficient and the people were super helpful and cheerful. 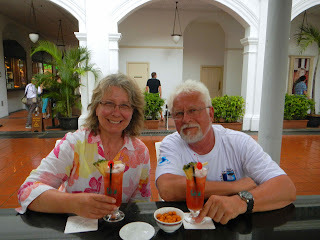 We made our way to Raffles stopping in the courtyard bar for their legendary Singapore Sling. This was big for me, as it reminded me of Saturday afternoons making them with my Mom and Dad. I wasn’t sure I could actually manage to drink a whole one but we ordered 2 and had our photo taken. Three sips later I gave mine to Graham, (not that it didn’t taste wonderful, I still couldn’t trust my stomach) and was grateful a colossal thunder and lightning storm struck so we took a cab back to the airport and I could fall into blissful sleep for the ride back. (Note: 2 Singapore slings - $65. Singapore dollars. Yikes) After half a dry piece of toast, and a sleep in the waiting room, and sleeping through another flight, we arrived in Melbourne with me feeling more human. 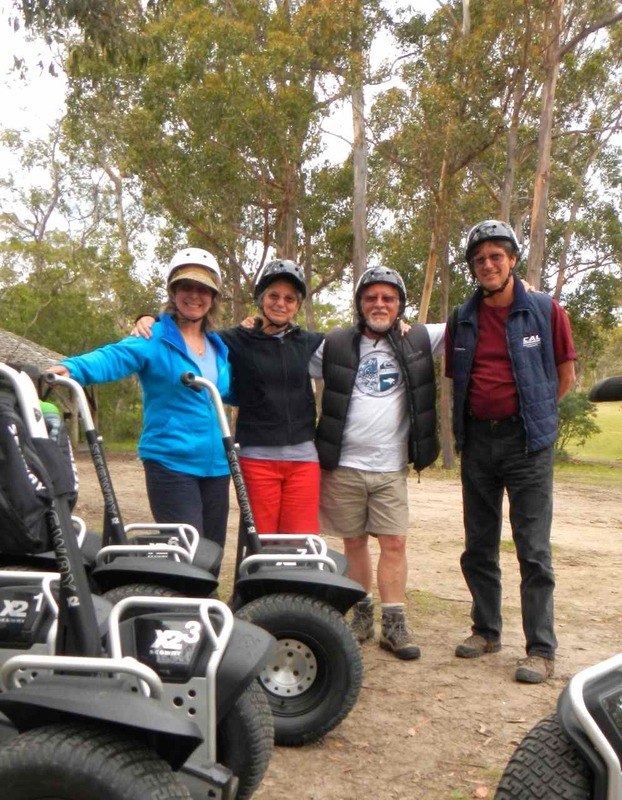 We met up with Tim and Gretch again in Melbourne for the flight back to Hobart and had 4 fun filled days with them. We had left Elwood with Rose, George and Winnie who took him up to their place for sleep overs. It was rather anti-climactic when we came home. We thought he must still have been with them, as we drove right up to the garage no Elwood. We opened the Garage door… no Elwood. We slammed 4 truck doors…. finally Elwood saunters around the corner yawning and just stands there and looks at us. No tail wag, no barking. Then he comes over and sniffs us and gives us a little tail wag. He really doesn't wake up quickly. By the time he figured out it was us, he didn't' have a trill or a woof woof to spare. The next morning he made up for it making quite a fuss when we opened the door. Rose assures us he wasn't drugged which was the only explanation I could think of for him not to have bowled us over upon arrival. We enjoyed a few more days with the Doolies cooking up a storm. Pizza night of course, Calamari on fresh picked salad greens, slow roasted prim rib steaks, an Aussie BBQ, Fish and chips, and burgers with "glutton duck". (an inside joke) To be honest, I was not as animated as I wanted to be as I seemed to have managed to pick up a head cold. But I did give it my all. Before we began - We look harmless enough. Hmmm doesn't look that hard…. 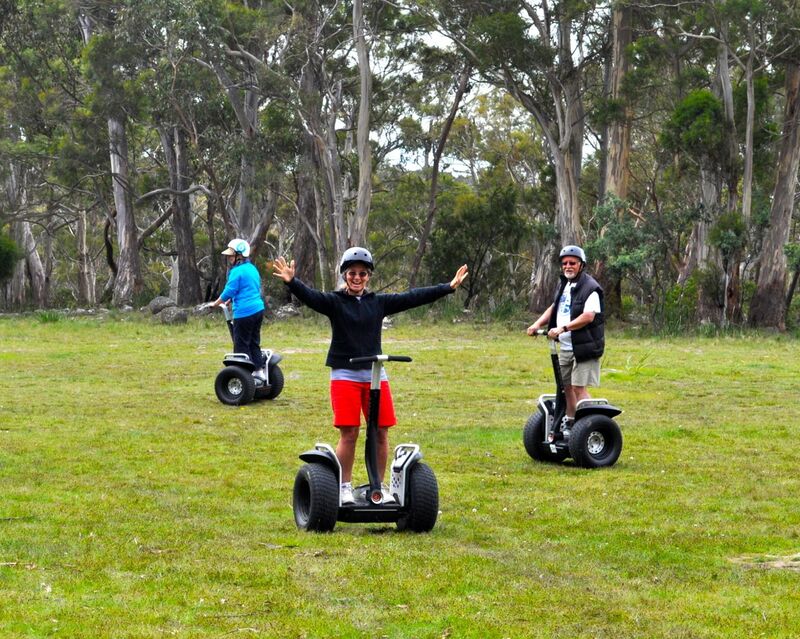 Back home, we had to have a little adventure so we went Segway'ing, how fun was that!! 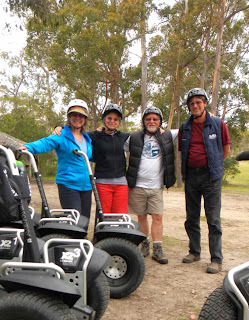 Our guide cautioned us there are the 4 c's in Segwaying. Cautious, Confident, Cocky and Crashed. She looked at us when she said this, and wasn't reassured with Tim's " Your not having fun 'til you dial 911". Well, the Sanders reinforced her concerns fairly quickly. 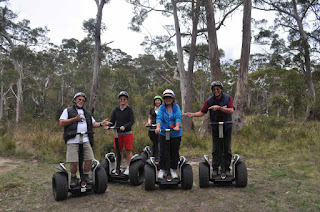 I had the first crash before we even left on our 'bush tour'. We four left the leader to instruct the latecomers and bolted to an empty paddock near by to 'practice. We were all scooting around the paddock, getting familiar, when I look up to see Gretchen Segwaying with no hands. So we all did it, and it was game on. 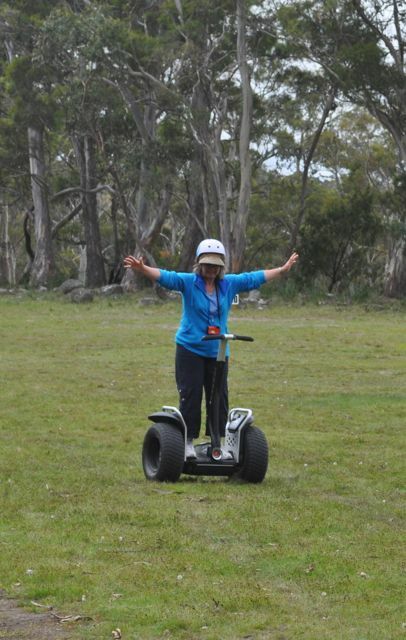 With crazy grins we returned when called, and I clipped the wheel of one of the new comers as I passed him. Did you know, these crazy devices turn off when they fall you know, so I was tangled in it on the ground with it mostly on top of me. That we me suitably subdued for a time, but the other 3 were still in the thick of it. Graham high centered near the end - and fell backwards like a turtle. Good thing we were wearing helmets. We both ended up with mild whiplash (sore necks), and bruises but did we ever have fun. The Doolies got away unscathed. (Most unlike Tim.) However Graham and Tim had us doing precicion turns, and in the end the boys put on a Segway Ballet. Smooth… If I knew how to upload a movie of it to this blog... I would. The Doolies gave us another Canada fix (and a darn good Blueberry dressing recipe) and lots of laughs and memories which we'll treasure until the next time. Sadly their visit ended, (boy it was great to see them and laugh so much) and that means it’s back to normal for us….